Routine wound preparation is appropriate for ear lacerations. For patient comfort, a cotton plug can be inserted into the ear canal during irrigation. If a wound extends deep into the canal, the integrity of the tympanic membrane should be verified. Regional anesthesia by auricular block is ideal. Epinephrine should be avoided in lacerations involving the ear. Impeccable hemostasis prior to repair is required to prevent the formation of a hematoma. Superficial lacerations to the skin can be closed with 6-0 monofilament interrupted sutures ( Fig 38-7). Any exposed cartilage should be covered to prevent subsequent infection. If an injury produces several crushed pieces of cartilage under the skin, they should not be removed; remaining cartilage will be beneficial if reconstructive surgery is necessary. Debridement of skin is not advisable, since there is very little excess skin available to cover the existing cartilage. In most through-and-through lacerations of the auricle, the skin can be approximated and the underlying cartilage will be supported adequately. In a large, gaping wound, one or two 6-0 nonabsorbable coated nylon stitches can be used to approximate the edges of cartilage. 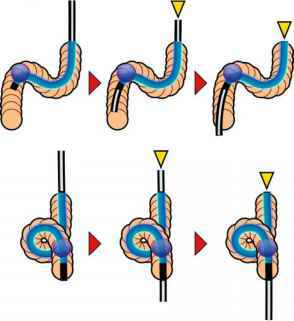 The knots should be tied so they will not cause an obvious deformity through the skin. If the overlying skin is avulsed, referral to a plastic surgeon for repair using a flap is recommended. 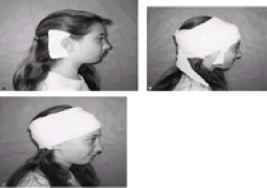 Following repair of the simple ear laceration, a small piece of nonadherent gauze may be applied over the laceration only and a pressure dressing applied. Gauze squares are placed behind the ear to apply pressure and the head is wrapped circumferentially with gauze [e.g., Kerlix (Kendall Healthcare Products, Inc.)]. The dressing may be tied into place by cutting the last portion of the gauze longitudinally ( Fig 3.8.-8). Sutures should be removed in 5 days. Complete avulsion of the ear must be urgently referred to a plastic surgeon. FIG. 38-7. A. Laceration through auricle. B. One or two interrupted, 6-0 coated nylon sutures will approximate divided edges of cartilage. C. Interrupted nonabsorbable 6-0 synthetic sutures approximate the skin edges. FIG. 38-8. Pressure dressing for ear lacerations. A. Gauze placed behind auricle. B. Bandage wrapped around head with two ends cut for tying. C. Ends tied. If an auricular hematoma is suspected, consultation with a plastic surgeon or otolaryngologist is recommended. Proper treatment requires the complete and permanent evacuation of the hematoma and definitive control of the bleeding that caused it. Neglecting to treat an auricular hematoma may produce a "cauliflower" ear type of cosmetic defect of the cartilage.